Jose Alday knew he had to make the best of a bad situation. He only had 19 hours to prepare for Gustavo Lopez after Alday’s original opponent, Levy Saul Marroquin, was pulled Thursday from their Combate Americas bantamweight title fight by the Arizona Boxing Commission because he was suffering from flulike symptoms. Lopez stepped in to replace Marroquin. 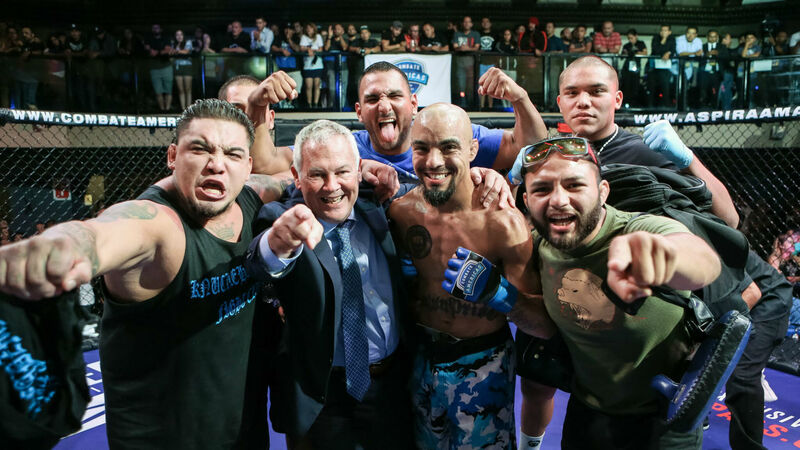 Alday stayed focused on his task and defeated Lopez by split decision (30-27 and 29-28, Alday; 29-28, Lopez) to capture the inaugural Combate Americas bantamweight belt Friday night in Phoenix. The bout was the main event of a card that was streamed live in the U.S. on DAZN, the live-streaming service of Perform Group, parent company of Sporting News. Alday and Lopez began the fight circling each other to gauge distance. About a minute in, Alday dropped Lopez with a right hand, but Lopez composed himself and got back to his feet. Alday stuck to the game plan and threw numerous head and body kicks to keep Lopez at bay. Noticing Alday was leaving himself open when he would throw a kick, Lopez scored a takedown. He then landed a series of ground-and-pound punches. Near the end of the round, Alday dropped Lopez twice with right jabs to gain momentum heading into the second. Lopez shut that down and dominated the second round. Alday connected on a sharp uppercut right up the middle to begin the round. Lopez showed no quit; he again took Alday down and immediately locked in a deep guillotine choke. Lopez squeezed as hard as he could and tried every which way to get Alday to tap out. Showing the heart of a champion, the 27-year-old slipped out and got the fight back to the feet. After a quick exchange on the feet, Lopez went back to his bread and butter, the takedown to control position, for the rest of the round. Alday and Lopez came out in the final round exchanging jabs and uppercuts. A scramble between the two led to Lopez getting a takedown. Both fighters were showing fatigue at that point. The pop on their punches was no longer there. Finally, with a minute to go, Alday turned it on, connecting on a left and a right to momentarily stun Lopez. That was enough for the judges to give Alday the victory and the championship. Alday (12-3-1) has now won three consecutive fights. This was not a title fight for Lopez because he was unable to make the required weight of 135 pounds on short notice. Cortez defeated Cedillo by TKO at 3:53 of the second round in the co-main event. Cortez began the fight going right at Cedillo for a quick takedown. Cortez poured down a series of ground-and-pound punches and then made a smooth transition to Cedillo’s back. She attempted a rear-naked choke but was unsuccessful. Tired of going that route, Cortez took Cedillo’s back and finally secured the rear-naked choke. To Cedillo’s credit, she escaped and survived the remainder of the round. Cortez (4-1) began the second round by doing what she did in the first round, securing an immediate takedown and going right into side control. Cortez was just waiting for Cedillo to make a mistake so she could capitalize and put Cedillo away Somehow, Cedillo got the fight back up to the feet. After throwing a knee flush to the head, Cortez took Cedillo back down to the canvas. The 24-year-old took Cedillo’s back instantaneously and started throwing a series hard shots to the head. Seeing that Cedillo’s wasn’t defending the shots intelligently, the referee stopped the fight. Cortez has now reeled off four consecutive victories after losing her pro debut.